On the same day Kevin Durant was officially named league MVP, 2K Sports has announced that he’ll also be on the cover of NBA 2K15 due out on October 7. It’ll be coming to the Xbox One, PS4, PS3, 360, and PC. 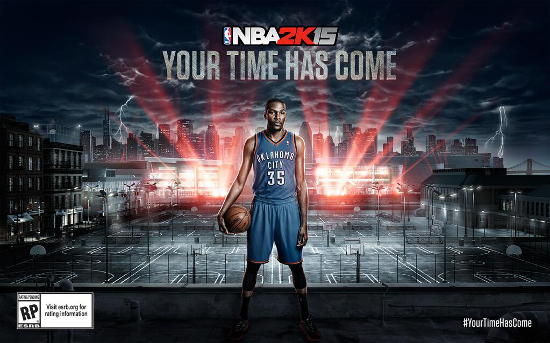 This will be the fourth video game cover for Durant. He appeared on NBA 2K13 (along with Blake Griffin and Derrick Rose) and March Madness 08. He was also set to be on the cover of NBA Elite 11. When that was cancelled he found out through Twitter which soured his relationship with EA Sports and he became a natural fit as a spokesperson for the NBA 2K series. The image released along with the announcement could suggest a bigger focus turned to the online mode “The Park”, which has been met with lukewarm response from the community, and the “Your Time Has Come” slogan may be referencing individual MyPlayers.